The Burchell family had been associated with Thornbury for a long time. Frederick Henry was born on 12th October 1873 and baptised on 19 Nov 1873. He became known as ‘Harry Burchell’. On 19th January 1885 Harry was admitted to Thornbury Grammar School with an Attwells Scholarship. The 1891 census shows he was aged 17, still living with his parents, who had now moved to St Mary Street. It shows that he had started work as a solicitor’s clerk. He married at St Mary’s Church on 17th May 1897. His wife was Elizabeth Mabel Mary Boulton who was born on 20th November 1870. She was baptised on 1st January 1871, the daughter of John Thomas Boulton, a butler and his wife, Susannah (nee Dawson). We understand that Elizabeth was known to the family ‘Lil’. The 1899 rate book and the 1901 census show that the Harry and Lil settled to live in the house that is now 8 Gloucester Road in Thornbury immediately after their marriage. Harry was aged 27, a solicitor’s clerk, born in Thornbury. His wife, Elizabeth Mabel Maud, was aged 30 and also born in Thornbury. They had one daughter, Dorothy Helen Burchell aged 9 months. When Harry and Lil moved into 8 Gloucester Road, they were moving in next door to the house where Elizabeth’s sister, Annie, was living in the 1891 census, and where her mother and brother, Harry Dawson Boulton, lived in 1901. The records of St Mary’s Church show that Frederick and Elizabeth’s daughter, Dorothy Helen, was baptised on 5th September 1900. 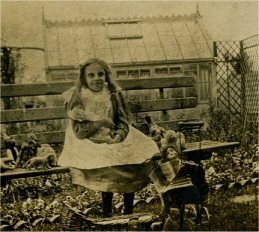 On the right is a photograph of Dorothy in the garden of Glenthorne. She died aged only 15 years and was buried in Thornbury Cemetery on 16th January 1916 . Her obituary tells us that she was invalided from birth and constantly taken out in her wheel chair by her attendant (whom we know to have been Maud Worsley). She finally succumbed following a short out of pneumonia. Various trade directories show that Frederick Henry Burchell was a solicitor’s clerk living in Gloucester Road. The 1907 rate book shows the Burchells still living at 8 Gloucester Road, but at some time before January 1908 they had moved to live in ‘Glenthorne’, 13 Gloucester Road. We know that the first house Glenthorne was occupied by January 1908. The Gazette of January 25th 1908 reported on a wedding reception at ‘Glenthorne, the home of Frederick Henry Burchell’. The wedding was between Frederick’s sister, Helen Burchell, and Robert George Daw. Harry and Lil continued to live here until their deaths. We were sent a copy of Harry’s personal accounts in which he noted he was paying Tuckers, the owners of Glenthorne, £5 10 shillings rent each quarter. The account books show the family spent £4 5 shillings on a holiday to Lyme Regis in July 1908. On 9th January 1908 Harry bought the row of cottages in Pullins Green (later known as nos 2 – 12 Pullins Green), paying £730 for the six properties. We know that in 1909/10 rents of about three shillings per week (£8 per year) were being received. In 1918 the houses were put up for sale at auction as three separate lots of two houses. We also know from Charley Davis’s account of his life that his brother, William, bought a piece of quarried land in Gloucester Road from Harry. William and Charley used this land to build the six houses later known as 21 – 31 Gloucester Road. The 1911 census shows Frederick Henry as a law clerk aged 37 living with Elizabeth Mary Maud who was 40 and their daughter, Dorothy Helen aged 9. Frederick’s brother, Robert John Burchell a market gardener aged 29 and Elizabeth’s brother, Harry Dawson Boulton, (described as ‘Assistant Clerk to Guardians and District Council’ aged 48) were also living in the house, together with Maud Worsley a domestic servant aged 18. Of the extra people in the house, Maud Worsley continued living there for the next 48 or more years. Robert John Burchell was there until 1931 except for the period during the First World War when he served in the Army. By 1935 he had moved to live in Eastlands. Harry Dawson Boulton was shown as being a lodger in Harry’s house in the 1913 electoral register and as all the later records show him as living in Gloucester Road we assume that he continued living there until his death in 1925. In 1948 Frederick Henry Burchell presented a talk, “A Tour of Thornbury”, to the Society of Thornbury Folk. A copy of this talk is included in the book “Thornbury: Pages from the Past”. In this, he referred to the fact that he started working for Messrs Scarlett & Gwynn, solicitor, which in 1891 were amalgamated with Messrs Crossmans & Lloyd. Apparently Frederick was employed by this firm for sixty years. Both Burchells were very active in public life. They were both ardent church workers and members of the Parochial Church Council for over 25 years with Harry being the Secretary of that body since its inception. He was also a licensed lay reader. Both of them were representatives of the Diocesan Conference. Lil was very involved with the Mothers Union, being its Secretary for over 21 years. She was also one of those responsible for the Thornbury and Falfield Women’s Unions. When the Thornbury Branch lapsed she continued actively supporting the Falfield Branch. She was a member of the Thornbury Public Assistance Committee, the Thornbury Food Control Committee and had been Vice Chairman of the Thornbury Conservative Association. The photo above shows Frederick Henry and Elizabeth Mabel Maud in their ‘parlour’ at Glenthorne. It is thought to have been taken at their golden wedding anniversary in 1947. Few men become a legend in their own lifetime and probably fewer still achieve a record of working in the same room for 70 years. Both these distinctions, however, are held by Mr, F. H. Burchell, Thornbury’s Deputy Registrar of Births, Deaths and Marriages. It was in 1889, exactly a decade before the first shots were fired in the Boer War, that Mr. Burchell, then a boy of 15, left school and went to work as a junior for a Thornbury firm of solicitors. 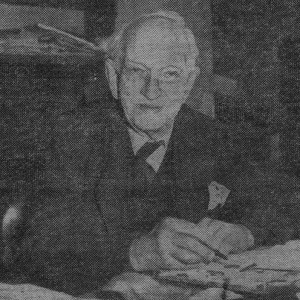 Today, 70 years later, he still works in the same first floor solicitor’s office in the centre of the village, to which he travels six times a week from his home in Gloucester Road, Thornbury. For the past 40 years, Mr. Burchell, a widower, has been the deputy Registrar of Births, Deaths and Marriages for the Thornbury district and in that time it is calculated he has issued 40,000 marriage certificates. The number of births and deaths he has recorded is legion. At the age of 85 he is certainly one of – if not the – the oldest registrars in the country……. Yet, he told us, “I intend to keep on for a few more years yet.” The man who has become a legend in his own lifetime in the lovely Gloucestershire village of Thornbury has also created something of a record by having remarkably little time off for sickness. In fact, the only instance he can recall being away from work was six years ago when he underwent an operation and was absent for about four weeks. By and large the arrangements for the marriages for which he has issued licences have gone smoothly but on one occasion he received an urgent telephone call from a vicar officiating at one wedding. The bridegroom, it appeared, had ‘lost’ his certificate and the vicar wanted to know whether he could proceed with the ceremony. Apparently the bridegroom had carried the certificate about with him for some weeks and as it had rubbed against other contents in his pocket the writing was indecipherable and the paper itself was almost worn away. Mr. Burchell solved the problem by telling the vicar to proceed with the wedding and immediately making out a new certificate’. Elizabeth Mary Maud died on 1st March 1955 and Frederick Henry died on 10 September 1959. They were buried in Thornbury Cemetery in the same grave as their daughter. We understand that Harry left Maud Worsley all his furniture and effects, together with a substantial legacy “in appreciation of her great devotion to me and my late wife for so many years”.